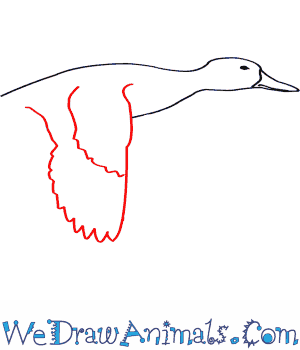 In this quick tutorial you'll learn how to draw a Blue Winged Teal in 6 easy steps - great for kids and novice artists. 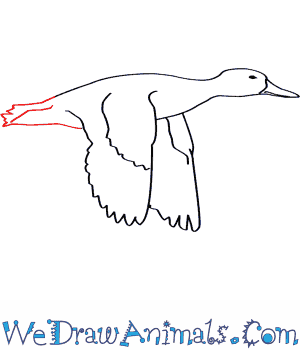 At the bottom you can read some interesting facts about the Blue Winged Teal. Step 1: Draw a curve with a bumped-up top. Draw a smaller curve under one end of this one for the head. 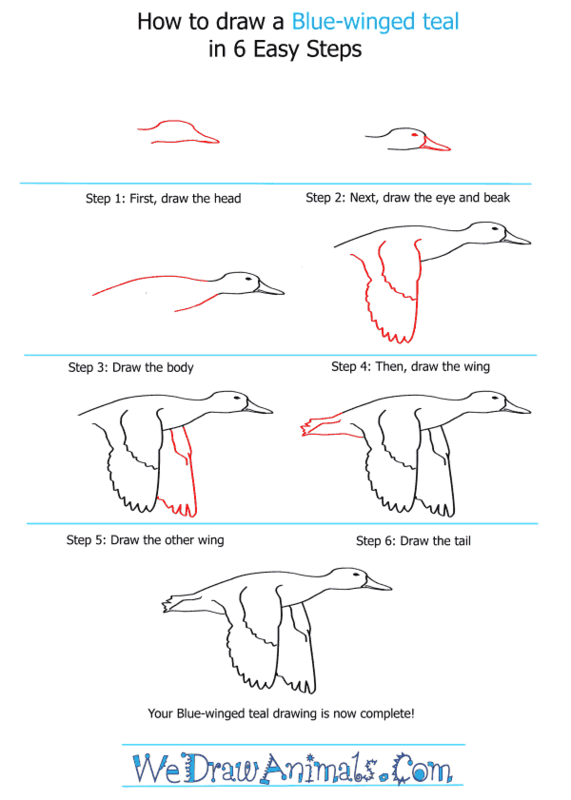 Step 2: In the point, draw a horizontal and vertical line to define the beak. 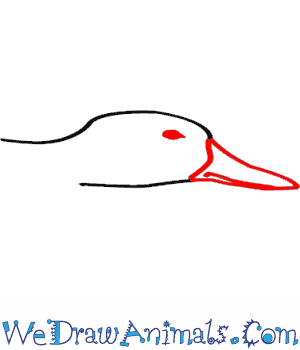 Add a dot in the upper bump, near the beak, for an eye. Step 3: Draw a short curve coming down from the bottom of the head and a longer curve coming down from the top of the head. 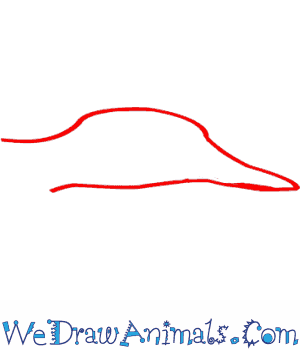 Step 4: At the bottom end of the body, Draw a large V-shape; the side facing away from the head should be wavy. At the midpoint on the side closer to the head, draw another wavy line angling back and up to the body. 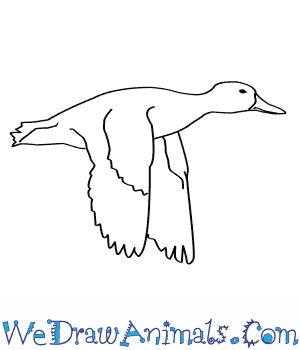 Step 5: Draw another, similar shape to this first wing between it and the neck. Step 6: Draw a line going back from each end of the body, which close off in a zig-zag line. Add a line in the tail to define it a little better. 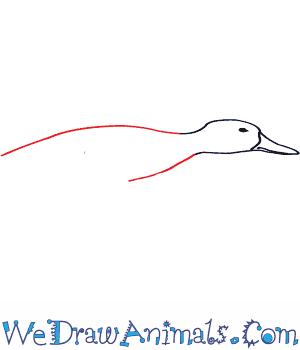 You have drawn a blue-winged teal! 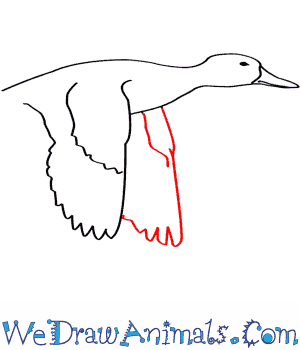 You can color it brown with lighter and darker patches and a white mark at the bill for a female. Or: light brown with a black tail, white patch near the rear, and a greyish blue head with a white crescent shape on the face for the male. The Blue-winged Teal is most common in the United States and Canada during summer breeding time. During winter they are mainly found from Southeast USA through Texas and south into Northern South America.They will nest in grass or vegetation and forage for food in shallow ponds or pond-marsh mixtures. During their summer molt, they are flightless and spend this time in large marshes and prairie potholes. They are the latest duck to migrate north in spring and first to migrate south in the fall. Among the longest distances to migrate, a flock found in Alberta Canada was then found one month later in Venezuela. In U.S. winter grounds they will live in fresh or brackish water wetlands or decaying organic matter. The main meal for the Blue-winged Teal includes crustaceans, clams, snails, vegetation, midge larvae and grain. Females lay 6 to 14 eggs with an incubation period of 19 to 29 days. A Blue-winged Teal will feed by dipping their bill into the water, submerging their entire head or tipping up to reach prey or vegetation deep under water. It is rare that they will dive under the water.